Kia’s largest and most rugged SUV, the All New 2020 Telluride, will be highlighted during the Program’s 3-Day activation over opening weekend in Park City from January 26 – 28, 2019, alongside culinary offerings by Green St. Kitchen of Palms Casino Resort helmed by Chef Due Cuisine Lanny Chin. Embracing the success of being a top food and fete film festival destination for celebrities and filmmakers each year, Hollywood event producer A-List Communications will bring its popular “Kia Telluride Supper Suite” pop-up back to Park City, Utah for the fifth consecutive year. The program runs from January 26th to 28th, 2019 featuring cuisine by Greene St. Kitchen, beverages by LIFEWTR, Tequila Comisario, Sensi Tuscany Wines, Blue Moon Belgian White and Dragonfly Coffee Roasters with Collider and L.A. Confidential Magazine. 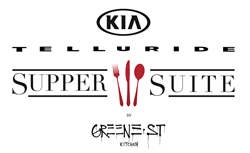 As it does each year, the Kia Telluride Supper Suite and its partners will serve as a premiere hospitality and fine food destination celebrating the top films and Hollywood A-list attending the film festival each year. The pop-up will again be located centrally on Main Street with a takeover of The Mustang restaurant. Elevating the culinary hospitality experience indoors will be Greene St. Kitchen of Las Vegas led by notable celebrity chef Lanny Chin along with acclaimed executive chef Joe Zanelli. The soon to open restaurant by Andy Masi’s Clique Hospitality, is a dynamic, design-driven dining experience bringing gastronomic innovation to the newly renovated PALMS Casino Resort. Blending together street art and food in a distinctive way, the restaurant continues the immersive experience and extensive art program of the hotel. The Modern American dining destination pays homage to the artistic communities of New York’s SoHo neighborhood during the early 80’s. Kia Telluride Supper Suite attendees will experience top of the line chef prepared dinners and catering by the coveted Vegas entity and hospitality brand. Creative libations to set the party tone will start with the ultra-premium and award-winning, Tequila Comisario®, available in three expressions, including mixable Blanco, aged Reposado and Añejo. These small-batch craft tequilas, owned by Elite Beverage International, are double-distilled and cold-filtered and made from the finest hand-selected 100% Blue Weber Agave found in the highlands of Jalisco Mexico. Recent awards and ratings include the coveted 2018 Champions of the World Spirits Competition; a "98 points" rating as Best New Tequila; and "#1 Best Blanco Margarita" by Cigar & Spirits Magazine. In addition, Elite Beverage International will also serve up their premium Sensi® Tuscany Wines. Guests will be treated to the Sensi Chardonnay Toscana IGT and Dalcampo Chianti DOCG. Chianti Dalcampo scored 91 points at the Annuario dei migliori vini italiani 2016, a top record in the Chianti category. A series of fine Tuscan wines with excellent consistency and harmonious softness in taste. In addition, Miller-Coors will also return for its 4th year partnership and serve its popular Blue Moon Belgian White, the perfect craft-brand for this culinary hospitality hub. Gourmet Coffee Brand, Tamas Christman’s Award Winning coffee company Dragon Fly Coffee Roasters will also furnish a deluxe coffee bar day and night inclusive of a signature dessert blend. Joining as the official water for the 2019 program is LIFEWTR, a featured sponsor of the annual Creative Coalition Spotlight Initiative Awards Gala benefit for funding for the Arts. LIFEWTR is committed to advancing creativity, starting where it all begins – arts education – and to that end has impacted more than 1 million students to date through arts education initiatives. LIFEWTR will continue this mission to support arts education programs in 2019, beginning with a mural project at a Florida City Elementary School in Miami, FL. In addition to the evening film dinners and parties, the Kia Telluride Supper Suite will also host the annual Collider Portrait and Media Studio during the daytime. Here, top filmmakers and actors will stop in during their press circuits to conduct interviews and to take cast portraits as exclusive content on the popular entertainment site, Collider, which garners over 11 million visitors and 50 million page views monthly. Talent scheduled to attend the studio within the Kia Telluride Supper Suite includes Zac Efron, Naomi Watts, Emma Roberts, Malin Akerman, Shea Whigham, Tony Hale, Mila Jovovich, Lucas Zumann, Jordana Spiro, Adelaide Clemens, Madisen Beaty, Octavia Spencer, Wendi McLendon Covey, Max Burkholder, Joe Berlinger, Lily Collins, Haley Joel Osment, Angela Sarafyan, Noah Schnapp, Mike Colter, Chiwetel Ejiofor, Rosamund Pike, Chris O’Dowd, Nick Hornby, and many more still to be announced. Brand partners also active during the day-part include mou, a luxury footwear and accessories line, who will return to Park City to gift its highly coveted winter boots and shoes to Hollywood's elite. Likewise, The Wild Immersion endorsed by Jane Goodall will be on-site with the world’s first ‘virtual reserve’. The Wild Immersion uses virtual reality to share an unrivaled 360-degree journey into Nature’s majestic territories to deepen our understanding of how each of us may support our planet and is presented in conjunction with the Blue Mind Fund, a non-profit starting a global conversation about the intersection between wild waters and the human brain based on the works of author Dr. Wallace J. Nichols.